12 can be had on goat for the same price, i believe. 12.5 for sure (and id def recommend half sizing up from your TTS or even preferred UB sizing. 12.5 actually sold already. I just received the notification on the price drop yesterday down to 160. Idk Ibout decofabric pen but sharpie amazed me on the first use. 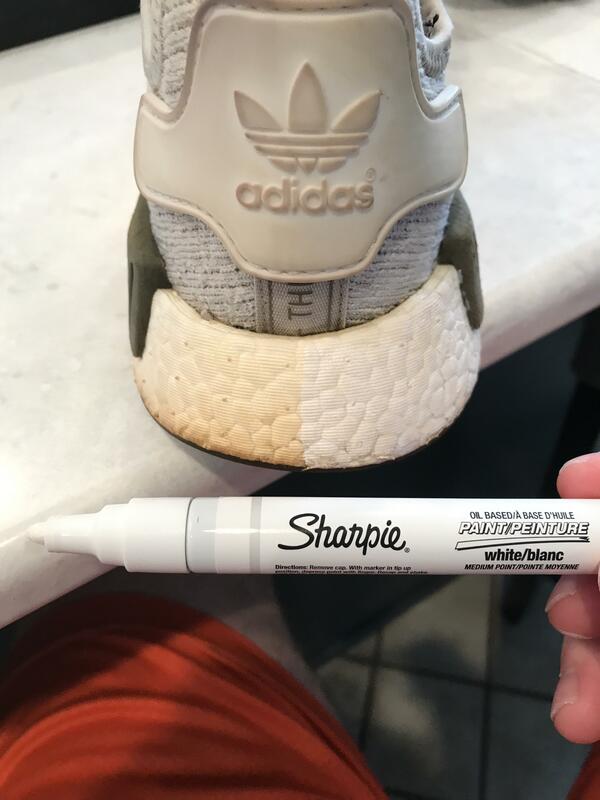 Because it's oil based it really soaks into the boost and not justt on the surface like a paint. fahqu001, Magic33, Sharpshoeter13 and 9 others like this. snkrfollower, mixology, sonoftony and 1 other person like this. Magic33, MaxP_3, ducktales and 8 others like this. Those look just like a pair I have. Levi's 512 sin city wash. One of my favorite pairs of jeans. Sharpshoeter13 and hnguy4 like this. Ive been trying to get a pair of the jetpack nite joggers for the past couple weeks can't find anywhere, the Adidas original store is gone in Seattle and they were never available online, now only the NY ones and they're sold out. Just got these today at Nordstrom it's funny they had them in stock for a few days but couldn't sell them till today for some reason. Any info on the jetpack versions would be much appreciated. Don't be scared of the tailor, they should know what to do. Just tell them how big of a leg opening you want (6-6.5" is what I find looks best) and where you want the taper to start. cgs37, hnguy4 and thepromisedland like this. yeah I'm mostly afraid of altering a pair of jeans that are already 90% to my liking. I'll probably go soon though and have them alter a few pairs that are not as favored. Adidas did a fine job on these. The boost is much better than the Stan smith and Superstar variation. The toe box feels more wide than it's non-boost counterpart so if you have narrow feet like me, .5sz down from your 1.0/2.0 UB size (or same size as your 3.0/4.0) is the way to go. Wider feets would appreciate these. nasischilling, blackfrankwhite, vinylbeing and 3 others like this. waiting on a deep disco for them Samboost! How is the Boost? I'm pretty happy with the Stan Smith Boost, but the Super Star Boost it's not like a Boost midsole at all. For $10-$20, you can get them closer to 100%. The white midsole was basically done for so i pulled out the plasti dip. Took about 3 minutes and i like how they came out. snkrfollower, caobone, gir and 1 other person like this.